Transportation • Salt Lake City police officer gets credit but not patent  for his 1912 creation. If you're stuck at a red light, blame Lester Wire. Got the green light? He gets credit there, too. But let's slow down and put a yellow caution light to that for a minute. Utah Department of Transportation officials on Thursday celebrated the invention of the traffic light 100 years ago by Lester Wire, a police officer in Salt Lake City who they said had grown troubled by the congestion and danger developing from traffic at the intersection of Main Street and 200 South. 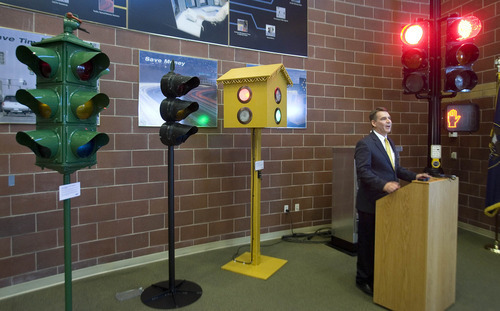 UDOT's celebration of Wire's invention included the unveiling of a replica of his traffic light at its Traffic Operations Center in Taylorsville. Wire's invention looked like a large birdhouse with lights dipped in green and red paint and placed into circular holes on each side. It was manually operated, with a police officer standing next to the signal mounted on a 10-foot pole. During peak times, the policeman's job was to flick a switch to change it from red to green. UDOT Executive Director John Njord said the invention changed motor vehicle history. "We can imagine what life would be like without signals at all," Njord said. "It's not a pretty picture to imagine." But Njord acknowledged that, while they believe Wire's traffic signal in 1912 was the first, he didn't get the patent for creating the technology. Lisa Miller, UDOT spokeswoman, said it's believed Wire got drafted and served in World War I and was unable to see the patent process through. UDOT officials said they now oversee traffic lights in about 1,200 intersections throughout the state using sophisticated technology that allows them to control car flows directly from their traffic control center or allowing a pressure plate system on the roads to determine the time each light stays red or green. Mark Taylor, a traffic signal operations engineer, said that, for example, vehicle flow on Foothill Boulevard for a University of Utah football game is altered to allow the high volume of cars to flow more easily. That is accomplished, he said, by keeping the lights synchronized and expanding the time they're green from the usual 60- to 90-second intervals to four-minute intervals. It's miles away from what Wire first propped up on the 1912 street shared by cars, bikes, horses and pedestrians all traveling at different speeds and in different directions. "People laughed when they first saw it," Miller said. "They thought it was confusing." "From a converted birdhouse on Main Street in Salt Lake City, the traffic signal can now be found throughout the world," he said. "Even in the most remote locations." 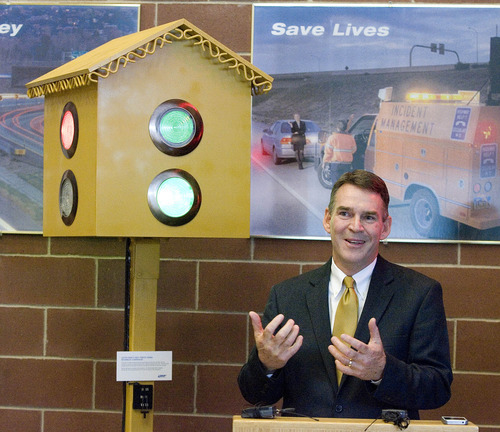 The Utah Department of Transportation has established a public display tracing the evolution of the traffic signal, beginning with a replica of the 1912 version invented by Salt Laker Lester Wire. The birdhouse-like prototype, along with three later versions, can be viewed in the lobby of the UDOT Traffic Operations Center at 2060 S. 2760 West in Salt Lake City.